Preheat the oven to 200C, gas mark 6. Cut 1 red onion into thin wedges and put in a roasting tin with the butternut squash and sweet potato and olive oil. Roast for 15 minutes, then stir in the mushrooms, season and cook for a further 10 minutes. Transfer the mixture to 4 individual pie dishes. Add 2 tbsp of water, the brandy and thyme to the roasting tin and bring to the boil on the hob, scraping any caramelised bits off the bottom of the tin as you go. Add the crème fraîche and, as it starts to simmer, stir in the nutmeg. Divide the sauce between the pie dishes. Cut the pastry into 4, then roll out each piece on a floured surface to a size slightly larger than the dishes. Brush the rims of the dishes with the beaten egg and sit the pastry on top. Trim away any excess and seal the edges with a fork; glaze the tops with egg, then make a small incision in the centre of each pie, to allow steam to escape. Slice the remaining onion into rings. Put a few slices on top of each pie. If using within 24 hours, chill until needed, then bake in a preheated oven at 220C, gas mark 7, for 25 minutes until golden. Alternatively, cover with clingfilm and freeze for up to 3 months, then remove the clingfilm and bake from frozen at 220C, gas mark 7, for 40 minutes, until it's golden, and piping hot in the centre. 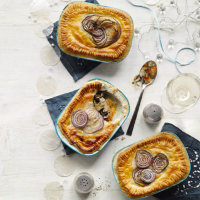 This sumptuous Australian blend is as rich and full of flavour as this superb pie, with ripe peach and apricot flavours and a creamy feel2. It’s also suitable for vegetarians.